From renowned seafood hotspots to iconic taverns, St. Augustine, Florida's food scene is unrivaled. Step onto the streets in search of a culinary adventure, and discover a city where timeless can also mean modern. With the Historic Bayfront boasting many of the city's top establishments, as well as enticing options farther out, you'll have no lack of choices during your stay. Housed in an elegant Victorian home, Raintree Restaurant serves some of the city's most delicious steak and seafood. The intimate interiors and generous service lend themselves nicely to a romantic dinner—why not consider booking our Love & Romance package for a night to remember? Columbia Restaurant puts an elegant spin on the city's historic cuisine, with over 110 years to their name serving irresistible paellas, tapas, flan, and dozens more dishes from the Spanish culinary canon. The quintessential place to meet, mingle, and celebrate, O'Steens is well worth the legendary wait to get in: This unpretentious, cash-only institution is regarded as home of the best shrimp and hush puppies on the East Coast. If crafted cocktails and succulents are more to your taste, try the Ice Plant. Beloved for their ceviche, beignets, and po'boys, the soaring ceilings and rustic environment is perfect for group outings, as well as quiet dinners. 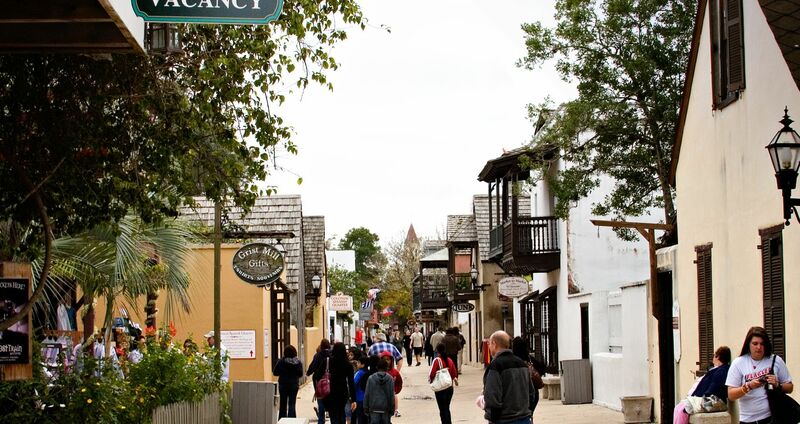 All these and more are only moments from our hotel in downtown St. Augustine. Ask our front desk staff for help in finding the perfect place to eat, and experience the city's very finest for yourself. Serving handcrafted cocktails with the perfect amount of ice. Athena Greek Restaurant is St. Augustine's premiere Greek restaurant serving breakfast, lunch & dinner. Offering a relaxing and inviting atmosphere, A1A offers food made fresh, from scratch, combined with a unique selection of rotating craft beers. An elegant eatery situated within the Lightner Museum. Offering classic and delicious Mexican, Latin, & Spanish cuisine. Located in the heart of historic St. Augustine, Catch 27 is dedicated to serving fresh, locally caught seafood. Celebrating more than 100 years, the Columbia prides itself on serving authentic Spanish flavors. A favorite among both locals and visitors, The Florida Cracker Cafe serves local flavors with the freshest ingredients. A combination of southern comfort foods and lighter, healthier, vibrant dishes. Located in a quaint garden, The Gourmet Hut is the ideal place to spend an afternoon. Enjoy delicious BBQ while listening to blues music and sitting under local art. Home to award winning pizza, Pizzalley’s Chianti Room offers the ambiance of both the main dining room or the wrap around veranda.